How can you stop a god from destroying everything --- even if you are a god? A young god graduates from God School and gets his dream job of building his first universe. Plagued by a school rival and aided by his friends, he struggles to build a universe he can be proud of in this humorous fantasy. A humorous fantasy about a young god whose job is fixing broken universes. Bernie is different from other gods, who tend to take a hell-fire-and-brimstone approach to problem-solving. Even if it’s the life of a murderous wizard bent on destroying anyone who opposes him. This is the prequel to the award-winning book, Bernie and the Putty. This story begins when our young gods are twelve years old. A little girl is lost, and our young heroes are the only ones who can save her from the deadly woods. 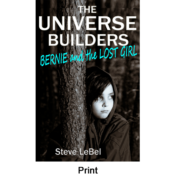 This is a free set of chapters for people who have read one of the books in The Universe Builder series. It tells all about the fight between Bernie and Billy that changed Bernie's life forever.